April will mark my five-year anniversary as a contributor to Collected Editions [congratulations and thanks! -- ed], and as a result, it’s the long-promised review of The Life and Times of Scrooge McDuck and its Companion. How long has this taken? Well, I first teased them all the way back in my Tales of the Bully Pulpit review back in 2007, which was three computers and two college degrees ago for me. I feel guilty, since Life and Times deserves its time to shine. Disney comics are huge outside of North America, especially the Disney Ducks, but their impact in America has been limited. Don Rosa took on the incredible task of assembling sixty or so years of Disney Duck continuity and putting together the coherent biography of its central figure, Scrooge McDuck. The Eisner Award he won in 1995 for the original book confirms that it worked. If you only know Scrooge McDuck from Duck Tales, well … you’re not far off. He’s ornery and cranky with a completely indomitable spirit. Life and Times (this review’s name for the main volume, for the sake of simplicity) explains how he got that way. Those looking for Donald Duck or Scrooge’s Duck Tales co-stars, his grand-nephews Huey, Dewey and Louie, in this book will be disappointed. They only appear at the end, and barely so at that. As a trade-off, however, we do meet Donald’s mother, and his violent streak is immediately explained. Indeed, few of the major Disney Duck characters are present here, mostly because this is set long before the events of Carl Barks’ Scrooge stories. This lack of other familiar characters becomes a non-factor very quickly since Scrooge is a fascinating lead. One of the book’s major themes is that, unlike his rivals, Scrooge made his fortune through hard work and sacrifice. This is what makes him different from two of his main rivals in wealth, the cheating scoundrel Flintheart Glomgold and the born-rich John D. Rockerduck. There’s one major exception to his policy, which takes place in the eleventh story of the book, and it explains why Scrooge became the bitter old man we saw when he first appeared back in 1947. However, because Scrooge has morals, it’s easy to admire him as a character. When he goes into a fit over losing out on a fortune, we feel sorry for him because he put an incredible amount of effort into it instead of swindling the money. Because the book takes place from 1877-1947, Rosa divided Scrooge’s life into twelve sections, correlated the “Barksian Facts” found in those old stories, and matched them to real events. He looked for certain major figures of the time to see if they were in the right place to interact with Scrooge McDuck. For instance, in Chapter 3, Scrooge works for cattle baron Murdo McKenzie in 1882 and teams up with Theodore Roosevelt to fight cattle rustlers in the Badlands of Montana. McKenzie was real and Roosevelt was in Montana in 1882, so the story is quite plausible, if not for a bison wearing a Tyrannosaurus rex skull. Some of the more bizarre plot elements are followed by Rosa asking the reader, “Prove it didn’t happen," promptly followed by, “Actually, please don’t." Don Rosa should write a book about all the research he did for his stories -- he has the perfect start for one, as each story comes with “liner notes." These sections explain which facts he took from Barks’ stories, how he wove them into real history, scenes left on the drawing table, and hidden Easter eggs. The latter come in two forms: Mickey Mouse heads and the word D.U.C.K., standing for “Dedicated to Uncle Carl from Keno [Don Rosa]." Try to look for these on the first page of each story. The Companion, a collection of related stories, is the weaker work, but is by no means bad. The stories fit into gaps between the main chapters, covering Barksian Facts he couldn’t fit in elsewhere or would seem redundant. For instance, “The Vigilante of Pizen Bluff," the third story in the Companion, was left out of the main narrative so that Rosa wouldn’t have too many Wild West adventures in a row. The volume begins with a time-travel tale starring Magica De Spell, a witch character, and was quite rightly left out of Life and Times due to its subject matter. It features Magica going back in time to steal Scrooge’s Number One Dime, the first coin he ever earned while working as a shoe shine boy. It features some artistic tricks, including different angles of the first chapter of Life and Times, and it explains why Scrooge’s first money was an American coin. Central to the Companion are the other parts of the “Yukon Scrooge” story. The climax of the main volume is Scrooge finally striking it big by finding a huge golden egg, interspersed with his dealings with Glittering Goldie, the love of his life, and Soapy Slick, a slimy riverboat entrepreneur. If you’ve seen scans of Scrooge demolishing a steamboat with his bare hands, they come from this story, even though Rosa himself dislikes superhero comic books and is uncomfortable with his readers enjoying Scrooge’s violence. Indeed, the notes frequently discuss the differences between comics in the United States and Europe, especially when it comes to the Disney Ducks. Rosa takes advantage of gaps in his central story, “King of the Klondike," to expand on Scrooge’s all-too-brief time with Goldie. If you enjoy Life and Times, it’s worth getting the Companion solely to get the whole story of this adventure, as it makes the climax of the entire series that more enjoyable. The final story in the Companion is “The Dream of a Lifetime," widely known throughout the Internet as “Duckception” because it predicted the plot and techniques of Inception years before the film’s creation. Throughout the Companion, a framing device has been in place featuring Donald digging up Scrooge’s chest of memories and Huey, Dewey and Louie asking about them. “Dream” is a reward for reading both volumes of the work, weaving through stories from both to demonstrate to Donald exactly how Scrooge got to be who is and why he shouldn’t be messed with. It’s almost difficult to talk about the art, because Life and Times is simply what a Disney Duck comic book is supposed to look like. Carl Barks set up the artistic standard, and Don Rosa perfected it. Crucial to the storytelling are the facial expressions, and Rosa is one of the most expressionistic artists. This is very impressive when Scrooge’s main emotion is ange r… and Rosa can draw twenty different stages of it, from mild irritation to “mad enough to rip apart a steamboat with his bare hands." Additionally, Rosa’s research can be seen in the gorgeous, detailed and period-authentic backgrounds. 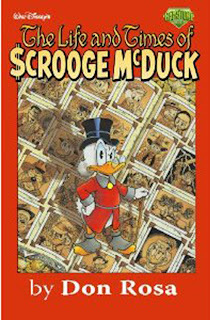 "The Life and Times of Scrooge McDuck, without question, deserves a spot on your shelf. It is one of the few pieces you can call a masterpiece without hyperbole. The Companion is a worthy addition, although I wouldn’t recommend getting it without the main volume. At $16.99, these books are a steal, especially with all of the commentary, covers, and a duck family tree amongst other extras. Both books used to be hard to find -- back in 2006, I had to special order Life and Times. Boom! Comics, the current Disney licensee and publisher of the outstanding Darkwing Duck comic, has recently reissued both books in a set of three hardcovers (Life and Times, Volume two). Whether you get these, or the old Gemstone softcovers like I have, they need to be a part of your collection. I have never understood the general fascination with the Scrooge McDuck books until now -- Doug sold me, too. How fascinating to parallel McDuck's fictional life with the real events of the turn of the century.